He and Democrats are at an impasse over his demand they pay for a border wall. As the government shutdown entered day 24, political fault lines continued to deepen. 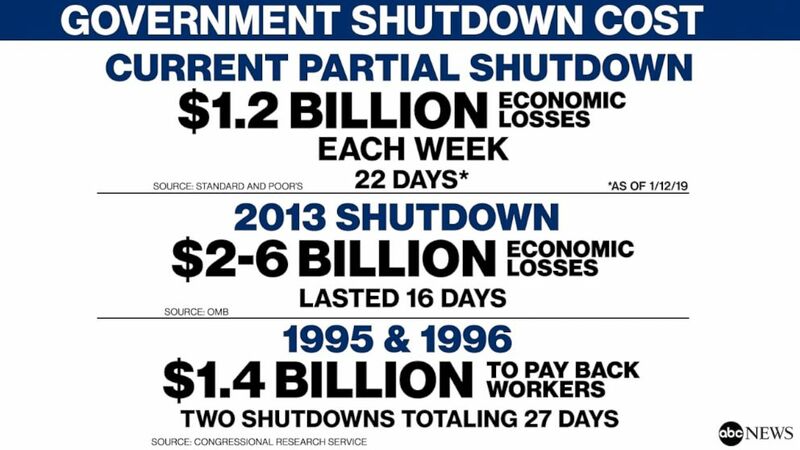 Meanwhile, 800,000 federal workers caught in the crossfire felt the reverberations of the lingering fight over reopening the government. Many of them have already missed their first paychecks since the shutdown started on Friday, according to the American Federation of Government Employees, and another one-third missed a paycheck Monday. About half of those federal workers, 420,000 people, are still required to work despite receiving no pay. Here's how the day is playing out. Farmers and agricultural producers have felt the impact of the shutdown largely through the shuttering of the USDA, with agriculture interest groups warning the shutdown will hurt farmers during an important season for their business. USDA's closure means that the loans, reports and other aid the agency provides to farmers in advance of planting and growing season are largely stopped until a deal is made to provide funding. The organization Farm Aid said calls to their hotline have doubled and that farmers calling in have not been able to apply for loans they often use to avoid foreclosure. Agriculture Secretary Sonny Perdue announced last week that the shutdown would also delay the next round of payments meant to help offset the impacts of Chinese tariffs and President Donald Trump's trade war. In addition, the shutdown could potentially halt the USDA's ability to implement programs authorized in the Farm Bill passed last month, according to Sen. Debbie Stabenow, D-Mich., the ranking Democrat on the Senate Agriculture Committee. Stabenow warned that delaying the bill's implementation could put farmers at risk heading into the new year. "Careful and quick implementation of the Farm Bill is critical to the well-being of American farmers and families," Stabenow said. "This shutdown will greatly slow implementation of this important bill, making it even more difficult for farmers to make planting decisions for this new crop year." President Donald Trump spoke at the 100th Annual Convention of the American Farm Bureau Federation Monday but largely focused his remarks on the border wall. Trump did not address the impact of the delay of federal subsidies to farmers but applauded the Department of Agriculture’s efforts to limit the shutdown’s negative effects on farmers. He also pledged to make the legal immigration process easier for those coming to the United States to work on farms. “It’s going to be easier for them to get in,” Trump said, without going into detail. With TSA experiencing higher-than-usual rates of workers calling out from work, the agency had to consolidate security checkpoints at several major airports across the country. Dulles International Airport, the largest airport serving Washington, D.C., closed checkpoints Monday morning in light of an increase in workers calling out. Security checkpoint operations have normalized there and at Miami International Airport, TSA spokesman Michael Bilello announced on Twitter. Bilello added that George Bush Intercontinental Airport in Houston and Hartsfield-Jackson Atlanta International Airport are still consolidating their security checkpoints. Update. Washington-Dulles International Airport has normalized operations. Currently, George Bush Intercontinental Airport and Hartsfield–Jackson Atlanta International Airport are exercising their contingency plans to uphold aviation security standards. TSA's unscheduled absence rate was at 7.6 percent for Monday, more than double the rate of workers who called out on the same day last year. As he left the White House for a trip to New Orleans Monday morning, Trump told reporters he is "not looking to call a national emergency" because solving the problem should be "simple." "I've been waiting all weekend. Democrats must get to work now. Border must be secured!" the president tweeted earlier Monday morning. Washington was already feeling the effects of the extended shutdown, which has closed or partially-closed scores of government agencies and national tourist destinations, but the city was also digging out of a snowstorm that dumped 6-10 inches of snow over the weekend, closing the federal government and D.C. public schools. In a second tweet Monday, Trump also used his often-used name for Senate Minority Leader Chuck Schumer, who he calls "Cryin' Chuck," and House Majority Leader Nancy Pelosi, who he called only "Nancy," claiming that Democrats could end the shutdown in "15 minutes." "At this point it has become their, and the Democrats, fault!" Trump tweeted. 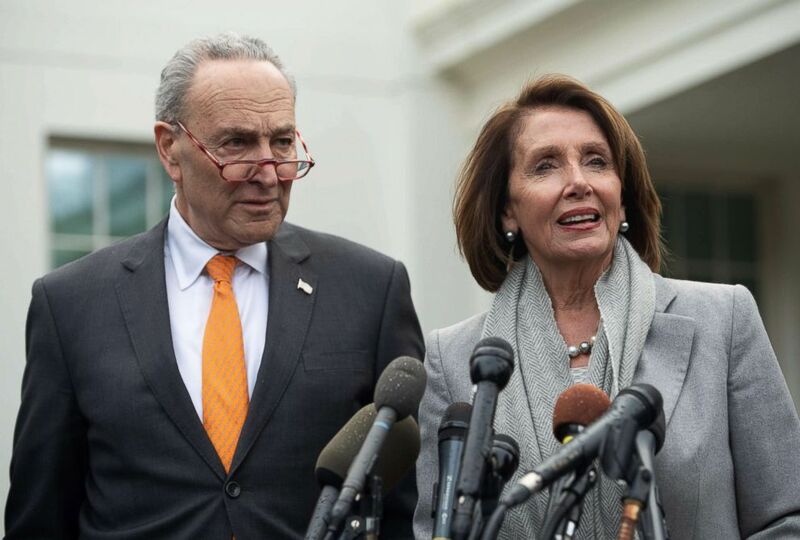 Democrats have called for the president to end the shutdown by abandoning the wall, one of his foremost campaign promises, and instead listen to bipartisan ideas on border security like sensors, radar or drones with cameras. Pelosi has called a wall an "immorality," arguing it won't effectively secure the border. Last week, Trump walked out of a meeting with congressional Democrats and called it a "total waste of time." In his speech to the American Farm Bureau Federation, Trump accused Democrats of trying to block construction of a border wall for their own political gain. "When it comes to keeping the American people safe, I will never ever back down. I didn't need this fight. This is a rough fight," Trump said. "We're dealing with people that think they can stop me from building the wall, but they think it's a good thing for 2020. They're not going to win." A new poll showed President Donald Trump increasingly getting blamed for the longest-ever U.S. government shutdown, he kicked off day 24 of the shutdown by again trying to blame Democrats for not agreeing to fund his proposed border wall. The president said he's "been waiting all weekend" for them to "get to work." According to a recent ABC News/Washington Post poll, a majority of Americans holds Donald Trump and congressional Republicans mainly responsible for the partial federal government shutdown. Only 24 percent of those polled agree with Trump’s claim that there’s a crisis at the southern border while 66 percent oppose his declaring a national emergency to fund a wall there, according to the poll. Fifty-three percent in the national survey said that Trump and the GOP are mainly responsible for the shutdown, while 29 percent blamed congressional Democrats, nearly a 2-1 margin against the president and his party. 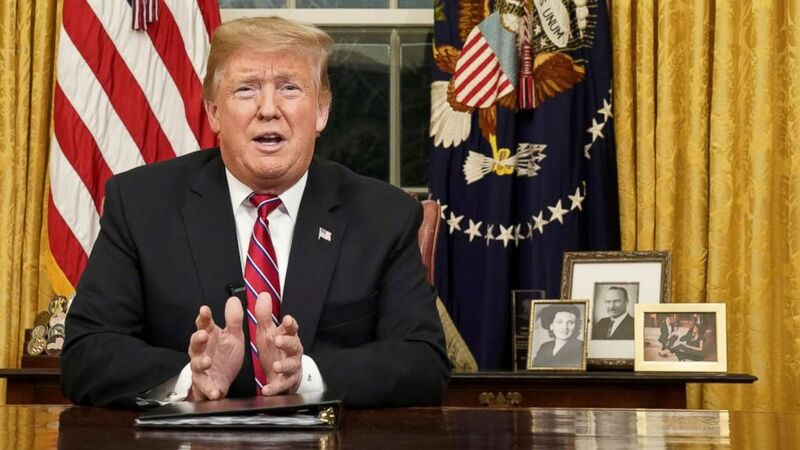 (Carlos Barria/Reuters) President Donald Trump delivers a televised address to the nation from his desk in the Oval Office at the White House in Washington, Jan. 8, 2019. Republican Sen. Lindsey Graham of South Carolina, often Trump's ally in the Senate, proposed that Trump briefly re-open the government in an interview on Sunday. But on Monday, as he was leaving the White House for a trip to New Orleans, Trump said he "rejected" Graham's proposal. "I want to get it solved. I don't want to just delay it," Trump said. Others, including House Minority Whip Steve Scalise, argue that it's time for Pelosi and Schumer to come to the table. Democrats continue to point to Trump's initial willingness to accept the shutdown, which he said he was "proud" to own during an Oval Office meeting with Schumer and Pelosi in mid-December. “If we don’t get what we want … I am proud to shut down the government for border security, Chuck,” Trump said at the time. ABC News' Meridith McGraw, Jeffrey Cook, John Parkinson and Stephanie Ebbs contributed to this report.